Panasonic expands multi-room range, reveals micro systems and headphones | What Hi-Fi? Panasonic's 'All Connected' wireless multi-room range will be boosted by the addition of new speakers and the first multi-room CD system, plus new headphones and more. The company is launching its full range of consumer electronics products for 2015 at its European Convention, with details on Panasonic's TVs, home cinema products and audio range being revealed today [23rd February] in Frankfurt, Germany. And there's plenty of news on the audio side of things: five additions to the Panasonic 'All Connected' wireless family, two compact micro systems and three new pairs of headphones, including what Panasonic claims are the world's first "dual axial drive" in-ear headphones. New products in the multi-room family come in the form of two speaker systems, the SC-ALL2 and SC-ALL5CD, a micro hi-fi system (the SC-PMX100), a soundbar (SC-ALL70T) and a 'speaker board' (SC-ALL30T). All these products have wi-fi and Bluetooth connectivity and will be powered by Qualcomm's AllPlay DLNA technology, which can also seen on multi-room speakers from the likes of Lenco and Monster. Most eye-catching, however, is the SC-ALL5CD (pictured, top); something Panasonic claims to be the first multi-room speaker to sport a CD player - as well as a digital radio and Bluetooth streaming. - and means you can stream your CDs from room to room. The SC-ALL2 (pictured, above), meanwhile, is a more familiar wireless speaker. 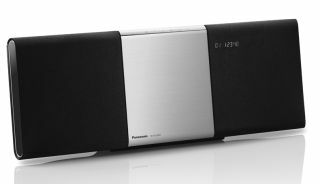 Panasonic has launched two new micro systems: the multi-room compatible SC-PMX100 (pictured, above) and the SC-PMX70. And there's a new Panasonic Music Streaming app, too, compatible with streaming services such as Spotify. Apple AirPlay and Bluetooth streaming are also supported, as is connection via NFC. Both systems support music file playback right up to 24-bit/192kHz high-resolution audio from a USB stick, while the '100 allows for high-res audio from a computer (via USB) or streaming wirelessly. The systems sport new amplifiers and speakers, developed especially for these products, and each delivers 120 watts of power. Finally, there are three fresh pairs of Pana' headphones to reveal, which comprise two sets of in-ears and a wireless over-ear pair. The RP-HJX20 (pictured, above) and RP-HJX5 models are the in-ears, with the former claiming to be the world's first in-ears with a "dual axial drive" - a design that has a second coil and magnet and that Panasonic claims improves accuracy. Both models have a bass boost function and come with a travel bag. The larger RP-BTD5 cans meanwhile connect via NFC and Bluetooth, have a built-in mic and remote for hands-free voice calls, and are good for 40 hours of wireless music (they recharge via USB). Panasonic also unveiled its new TVs for 2015, as well as a range of Blu-ray players and other home cinema products - details of which are to follow. We'll be adding prices and release dates on all new Panasonic kit as soon as we have them.